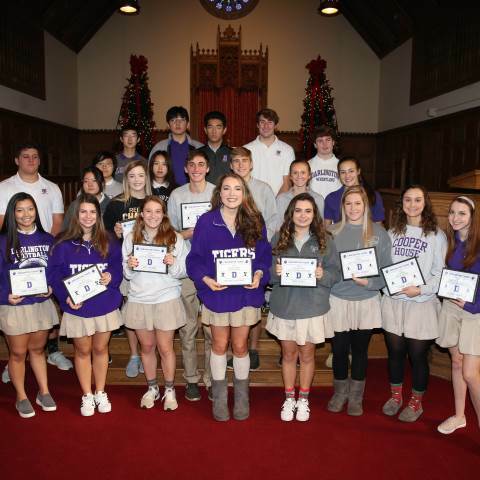 Outstanding athletes in varsity cheerleading, crew, cross country, football, softball and volleyball were recognized at the Fall Sports Assembly on Monday, Dec. 3, in Morris Chapel. Junior Tate Ratledge of Rome, Ga. received the Most Valuable Performer Award. Senior Tommy Atha Jr. of Rome, Ga. received the Pillar Award. Senior Rhett McDurmon of Rome, Ga. received the Academic Award. Senior Lexie Floyd of Adairsville, Ga. received the Most Valuable Performer Award. Senior Anaston Ballard of Summerville, Ga. and Hayden Baldwin of Centre, Al. received the Pillar Award. Junior Jalyn Massey of Cave Spring, Ga. received the Academic Award. Freshman Corrine Lian from Datong City, China received the Most Valuable Performer Award. Sophomore Mulan Duan of Beijing, China received the Pillar Award. Junior Belle Zhu of Shanghai, China received the Academic Award. Senior Tom Guo of Beijing, China received the Most Valuable Performer Award. Sophomore Steven Yan of Shanghai, China received the Pillar Award. Senior Jollyoung Liu of Shanghai, China received the Academic Award. Junior Maggie Hawkins of Cedartown, Ga. received the Most Valuable Performer Award. Senior Ashley Hankinson of Kingston, Ga. received the Pillar Award. Junior Frances Fields of Kingston, Ga. received the Academic Award. Senior Lawson Blake of Rome, Ga. received the Most Valuable Performer Award. Senior Jack Eady of Rome, Ga. received the Pillar Award and Academic Award. Junior Olivia Adams of Rome, Ga. received the Most Valuable Performer Award. Senior Gabby Fuller of Rockmart, Ga. received the Pillar Award. Junior Caroline Dingler of Cedartown, Ga. received the Academic Award. Senior Alli Hagler of Rome, Ga. received the Most Valuable Performer Award. Senior Annabelle Braden of Rome, Ga. received the Pillar Award. Junior Abbie Vaughn of Rome, Ga. received the Academic Award. Click here to see a photo gallery from the assembly.